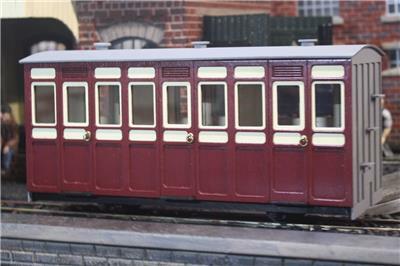 Made from wood with real glass windows, this freelance four wheeled coach is a sturdy design which looks perfect behind a 16mm loco. Pre-Made: Available in either maroon with cream panels. Couplings are fitted in the finished version, Minimum radius is 2’6”. Supplied as 32mm gauge, the wheels can easily be re-gauged to your railway. The Parcel Van and 2 Compartment Coach are of very similar design, intended to make a uniformed train.